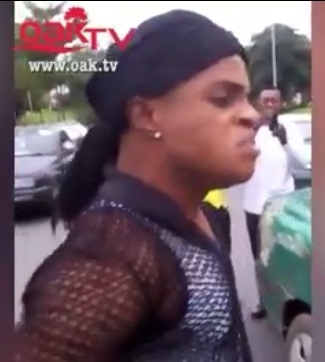 Nigerian gay passenger who tried to seduce taxi driver in Abuja, have been spotted lambasting one another opposite a total filling station in Wuse, Zone 4 in Abuja. 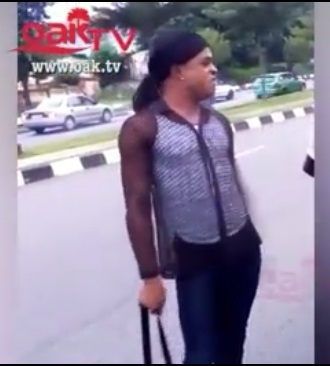 A young Nigerian gay man created a scene on Tuesday morning in the federal capital, Abuja after he was engaged in a heated argument with a Taxi driver in the Wuse, Zone 4 area, around Febson Hotel in FCT. 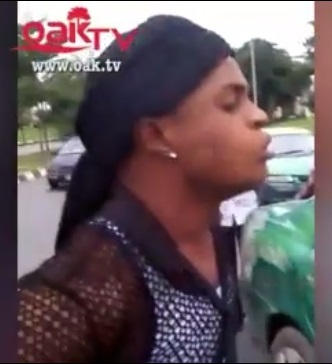 According to video posted online by Oak TV, the gay passenger who was seen dressed like a woman is reported notorious for moving around as a lady especially at night in a bid to seduce his potential clents and make both ends meet. The shameless man was captured on camera screaming that this is his business; ”I dey f*ck for yansh, then they f*ck me for yansh, Na man I be, Na my business, I no dey shame”. While narrating how the gay man was busted trying to seduce him, the taxi driver who simply identifies himself as Israel said; “the guy stopped me, he told me I should take him to heritage and we agreed on N500 for the fare. But for the timely intervention of the police, the passenger would have been mobbed by an angry crowd that gathered around them.